Severe water scarcity affects at least two-thirds of the world's population, or about 4 billion people, according to a new study. These people experience severe water scarcity at least one month a year, and the number is far higher than the 1.7 billion to 3.1 billion people suggested by previous research. Nearly half of the people affected are in China and India. 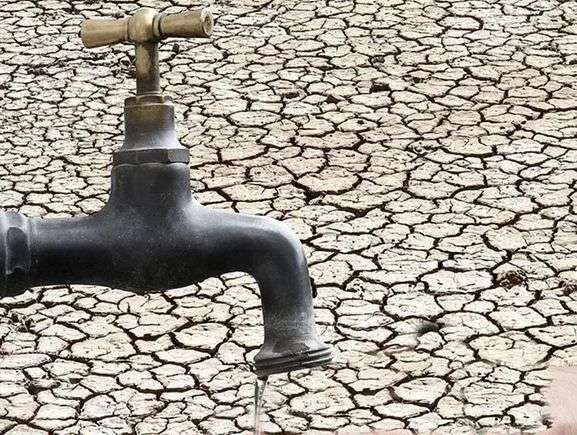 Other countries where large numbers of people are affected by severe water scarcity for at least part of the year include Bangladesh, Mexico, Nigeria, Pakistan and the United States (mostly in western states such as California and southern states such as Texas and Florida), the study found. The rising worldwide demand for fresh water is being driven by a growing population, increased agricultural irrigation, higher living standards and changing consumption patterns, according to the researchers led by Mesfin Mekonnen and Arjen Hoekstra of the University of Twente in the Netherlands. They said the threat can be reduced by placing limits on water consumption, boosting water use efficiency, and improving sharing of fresh water resources. The study was published Feb. 12 in the journal Science Advances. Terrible that 4 billion people don't have the ability to form a rational government. Wait until the glaciers dry up, and more than one billion people run out of water. When that happens, we can send them our Deniers. That is all good and well they said that. But the elephant sitting on your lap is the simple fact that there just might be 4 billion too many peoples in the world for them all to get along. This level of populations is even newer than making all the greenhouse gasses and wasting water. Why they don't talk about that as much or more than the environmental stuffs? Use efficiently, grow more peoples, use even more efficiently, grow even more peoples, use more efficiently, and guess what? If they still grow more peoples you are going to run out of "more efficiently"s to try. Conservation don't mean much if you save half and double the users. When discussing resource shortages, political solutions are usually toxic. In this case, what we have is not really so much a water shortage as it is a water quality shortage. Countries can and have built pipelines and filtration systems that will make the desert bloom. It's only a matter of energy. And, in fact, this is one area where renewable energy can play a big part because the end product can be stored very inexpensively. However, if someone campaigns saying that you must not "waste" water, and that "We" (meaning they) must manage the resource effectively --watch out. They're not interested in building any new supplies, they're mainly interested in running the civilization. As far as I'm concerned, they can pound sand. All we need after that is a good old fashioned war to get rid of the cheap capitalists' work force. Countries can and have built pipelines and filtration systems that will make the desert bloom. Whole deserts? Or little bitty tiny pieces of deserts? There is a difference between a desert and some oil sheikh's yard and gated compound. It's only a matter of energy. And, in fact, this is one area where renewable energy can play a big part because the end product can be stored very inexpensively. Okay then, let's crunch some numbers. How much it is going to cost to make the desert wet enough to store the energy? Not a pilot plant, but one to really do something for billions of peoples? Building new supplies is not going to mean much if the supplies of people keeps growing by billions every 20 years. As far as I'm concerned, they can pound sand. Them is the ones you got to worry about, they are getting tired of doing that and want what you got. P.S. for you Jacob because I almost forget. Trut be told I did forget. I am with you on that one Cher. But hooyeei, answer me this simple question please. Spending a few trillions dollars to make a few billions people's desert bloom into farm land is going to take a whole lot of politicking, eh? How you going to get around that? All those have-not's are learning about what you and I do-have's got. That's the wonder of the interweb. And trust me Cher, more and more of them are going to try to come here and have it too. Giving them what we have is going to cost a lot of money. Or trying to keep them out is going to cost a lot of money. And either is doomed to fail if you consider the magnitude of it. All of human's history is full of peoples migrating to get what other peoples have. And they always make through in the end. So sit back and watch the fireworks? cuz that's what im getting outa this. And the election process this year in america. oooo wee that's a fun and interesting one to watch. Superdelegates billionares old people wow its amazing how old white people invigorate a country with words. There isn't enough stuff for us all to be doing the america thing that's for sure. I don't think having Stumpy argue with them is really an appropriate response.